A guy riding a Citi Bike just in front of me was in the wrong place (the bike lane) when a car decided to make an aggressive lane change (into the bike lane) so that he could pass a taxi and wait at a red light for a little bit longer. The Citi biker put his had out and braced himself against the side of the car, and then when the car pulled away, the biker went for a ride over his handlebars and cartwheeled for a few feet. His bike cartwheeled right along with him, and when he stood up, instead of doubling over in pain, he grabbed the back wheel of his bike, dragged it to the car that had hit him, and punched in the guy's sideview mirror. I rode past slow enough for a good rubberneck and saw the driver putting his car in park. On the next street I saw three oyster deliver vans, and on the next I saw a Christmas-themed film being shot with about 20 pedicabs. What's interesting to me is that now these filmmakers have to contend with Citi Bikes. They're part of the cityscape in the same way cabs are. 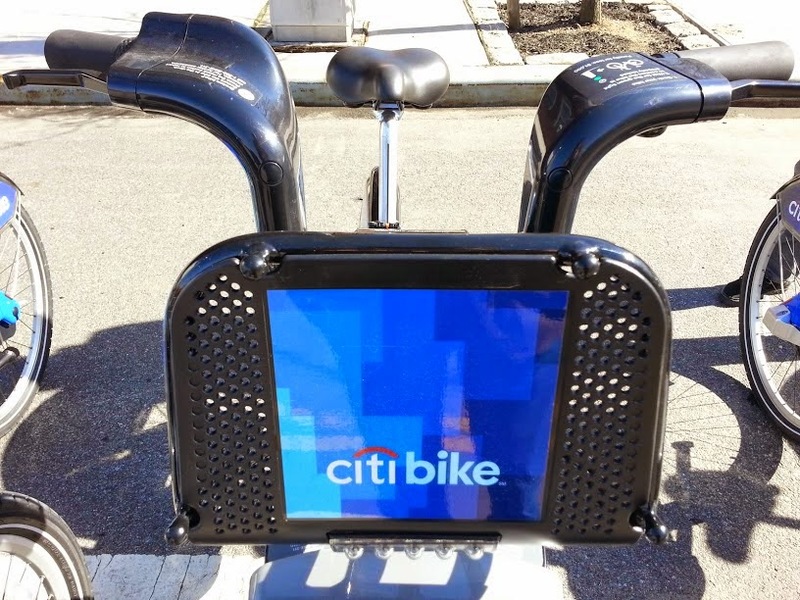 And like cabs, we'll soon be able to use the style of Citi Bike in a film to date it. Fifteen years from now I'll be watching the latest comic book film reboot and see a guy pedaling past on a big blue Citi bike and say, "Hey, I saw a guy on a bike like that punch out a mirror once. This was shot in 2014."